Another gorgeous day in January and a fantastic day hike by the Sacramento County Hikers in the Golden Gate Heights District of San Francisco. 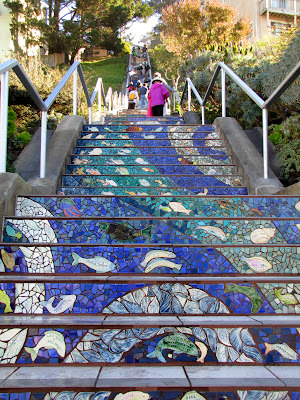 This very hilly neighborhood lies south of Golden Gate Park and is known for it's network of artistic tiled stair pathways. About 24 hikers participated in the hike of approximately 6 miles led by our intrepid leader Rich Blackmarr. Rich plotted a loop route that weaved its way up and down many staircases with stops at some hilltop parks with heady panoramic views of San Francisco, the ocean, and the Marin coastline. On the drive down to SF, we crossed the new east span of the Bay Bridge. The slick new approach to downtown SF was a fitting start to an absolutely beautiful day.